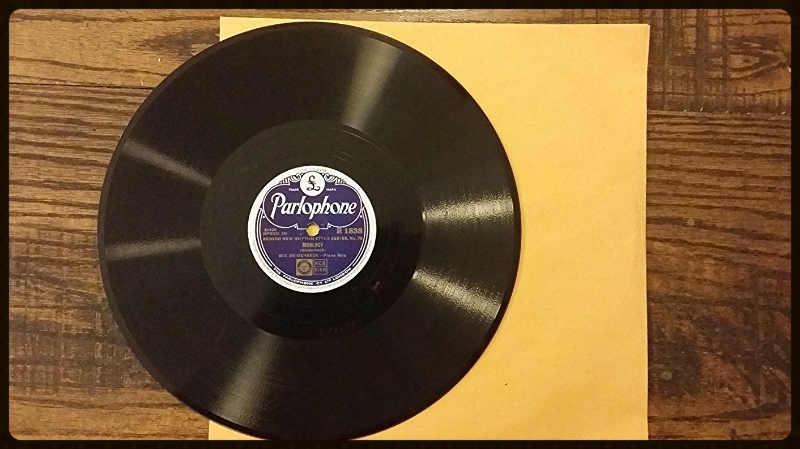 A few years ago I was fortunate to stumble upon some Parlophone 78s in pristine condition at Amoeba in Los Angeles. For those unaware of Parlophone - it was a record company in England, whose collection is now owned by the Warner Music Group. One of those records contained the song 'Bixology' by the wonderfully talented Bix Beiderbecke's ('Bixology' is Bix Beiderbecke, both his story and his music, the alternate title for the piano-composed etude, 'In a Mist'). For those who are unaware of Bix Beiderbecke - please watch Ken Burns: Jazz (available to stream on Netflix). In short, he was simply was one of the greatest jazz musicians, but suffered a tragic life and died at 28 years old. However, before his death, he blessed the world with music. He not only played the piano, but was incredible on the cornet, which you usually find him photographed with - as seen here. Along with both Louis Armstrong and Muggsy Spanier, Beiderbecke contributed a good deal to jazz in the 1920s: improvisation, purity of tone, plus as you can see in 'Bixology', you can see the root to "cool jazz," the mix of classical with syncopation. This recording is from my own Parlophone 78 and I share this with you for entertainment and educational purposes. According to the information in Norman Field's article on "Parlophone in the Bix era," this is a British reissue probably from the 30s (original recording from 09/09/1927). Note that Bix' last name is misspelled (they left off an "e"). I hope you enjoy the song and are inspired to find out more about Bix Beiderbecke, both his story and his music.